Because most fans select their fantasy rosters in real time, and many leagues consist of people from across the globe, we think you'll find that hangouts are a natural extension of your (healthy) obsession. Not only can you connect live with your friends on draft day; you can actually gloat celebrate in person, regardless of where your league members are located. We're also upping the number of hangout participants from 10 to 12 on NFL.com/fantasyfootball, since the standard fantasy league has a dozen players. The +NFL Network will broadcast weekly highlights from some of these commentator hangouts. And of course, you can always share fantasy articles and tips with your circles—either from the NFL’s site, or their newly-launched Google+ page. 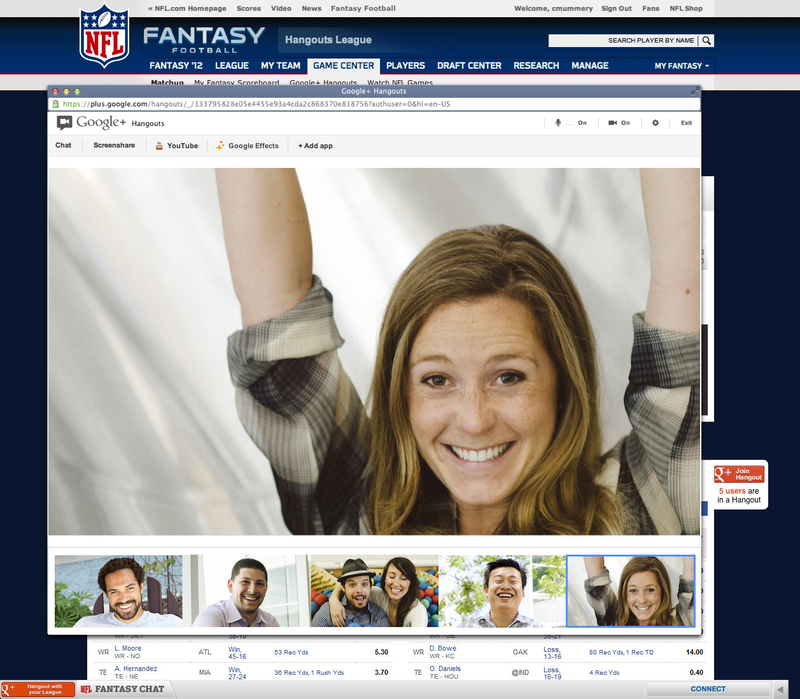 Visit NFL.com/fantasyfootball today to sign up, and to prep for your draft via hangout. If you like football but haven’t yet played fantasy, this year’s a great time to start. After all, hangouts help make fantasy football about more than just the game; they’re a great way to build lasting relationships on any given Sunday (and every day in between).